Elbow pain may encompass a variety of disorders as it is a region where many different muscles, tendons, nerves, ligaments, and joints are found. In addition, there are bursas which can be inflamed and intraarticular joint problems such as arthritis that must be considered. 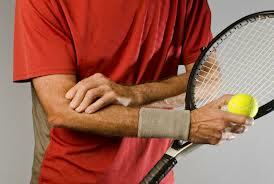 Frequent causes of elbow pain include tennis elbow, tendonitis, golfer’s elbow, arthritis, bursitis, and nerve pain. The elbow joint is formed where the long bone in the arm (humerus) meets the inner bone of the forearm (the ulna) and the outer bone of the forearm (the radius) to form a hinged joint. Also in the elbow, the radius and ulna meet to form a joint that allows rotation of the forearm or pronation and supination. This is the twisting inward and outward motion that occurs in the forearm. The major muscles involved around the elbow in the anterior aspect are the biceps that flexes the elbow, hinged joint and the triceps, the large muscle in the posterior aspect of the arm which extends the elbow. The outer bone of the elbow is known as the lateral epicondyle and this is the bony protuberance of the humerus. The inner portion of the elbow with the bony protuberance is called the medial epicondyle. The tendons insert on to the epicondyles and may be a source of pain with chronic inflammation or tendonitis referred to as lateral epicondylitis or tennis elbow. The medial aspect of the elbow tendons insert and can be also a painful area with tendonitis referred to as medial epicondylitis or golfer’s elbow. In the posterior aspect of the elbow, there is a bursal sac which overlies the bony protuberance known as the olecranon and this bursa is referred to as the olecranon bursa and this can be involved with chronic inflammation or irritation from a variety of causes. A large nerve tracks along the olecranon in the region referred to as the funny bone, the ulnar nerve, can be irritated from acute or repetitive trauma and can give nerve-type symptoms in this area. Additionally, the radial nerve can be entrapped as well as the median nerve at the region of the elbow and cause nerve symptoms that may be confused with other chronic conditions. Intraarticular pathology such as arthritis can be the result of multiple problems most frequently degenerative or osteoarthritis. Other inflammatory arthritis such as rheumatoid arthritis needs to be considered in the differential diagnosis. A skilled history and physical examination should be performed by a physician knowledgeable in sources of elbow pain. Additionally, laboratory testing or radiographic studies may be necessary as well as electrodiagnostic testing (EMG/nerve conduction studies) to evaluate more difficult cases. Dr. Lox often sees patients with chronic conditions in addition to acute sports type injuries and often they may have seen numerous physicians and an accurate diagnosis sometimes is not made. In cases of persistent pain that does not respond to conservative treatment, a more definitive diagnosis is essential. When conservative modalities such as anti-inflammatory medications, therapy, and other pharmacologic therapy or splints and braces fail to provide resolution of symptoms, patients often turn to surgical intervention out of frustration at the persistence of their symptoms. Alternative treatment strategies for chronic elbow pain such as platelet-rich plasma (PRP) and stem cell therapy have been utilized with success in the treatment of chronic elbow complaints. Dr. Lox stresses that it is important to have an accurate diagnosis prior to proceeding with any procedure to treat chronic conditions. He also points out that acute conditions can be alleviated through the use of regenerative medicine techniques such as platelet-rich plasma (PRP) and stem cell therapy. Resistant chronic elbow conditions have responded quite favorably to these modalities. The utilization of a comprehensive rehabilitation program in the management of chronic elbow conditions is a paramount factor in successful treatment, Dr. Lox notes. Incorporating cutting edge alternative treatment strategies such as platelet-rich plasma (PRP) and stem cell therapy have been utilized for a variety of musculoskeletal disorders.